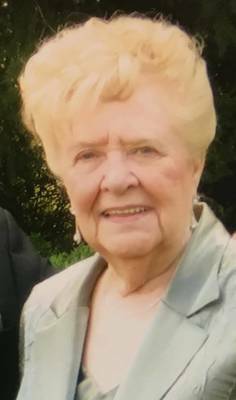 South Plainfield – Doris Lenora (Snyder) Siedenburg, 86, passed away on Tuesday, December 18, 2018 at her residence with her loving family at her side. Born in Newark to the late Isaac and Hazel (Pedrick) Snyder, Doris lived in Roselle Park until moving to South Plainfield fifty-five years ago. Doris enjoyed time with her family as a homemaker. Prior to marriage, Doris worked for Western Electric, Elizabethtown Gas and Woolworths. In her younger years, she was active with the Roselle Park Fire Department and served as President of the Ladies Auxiliary. She also enjoyed all the time spent with numerous women’s clubs when her children were young. Always having a fresh tray of cookies waiting for her grandchildren, she was known as Grandma Cookie. For many years, Doris and her husband Charles were members of St. Stephens Lutheran Church and were very active with the South Plainfield Fire Department, having enjoyed many functions with her fire department family. Doris had a contagious laugh and beautiful smile that everyone will miss seeing during the many family gatherings where she opened her home for the holidays and other family functions. Predeceased by her sister Hazel Dykovitz, Doris leaves behind her loving family; husband of sixty-one years, Charles R. Siedenburg, daughters Deborah Wagner and her husband Joseph and Donna Krebs and her husband Thomas and her son Charles Siedenburg and his wife Amy. Doris will be missed dearly by six grandchildren; Kevin, Kerri, Christopher, Adrianna and Dina Siedenburg and Joseph Palma and his wife Kelly, brother-in-law Stanley Dykovitz and nephew Stanley Dykovitz and his wife Nikki. Visitation will be held in the McCriskin-Gustafson Home for Funerals, 2425 Plainfield Avenue, South Plainfield, NJ 07080 on Thursday, December 20, 2018 from 5-8 pm and on Friday, December 21, 2018 beginning 9:30 am. Funeral services will take place on Friday, December 21, 2018 beginning 10:00 am in the funeral home followed by burial at Graceland Memorial Park in Kenilworth. In lieu of flowers, donations sent to the South Plainfield Volunteer Fire Department would be appreciated. Please visit www.McCriskinFuneralHome.com to send condolences to the Siedenburg family.